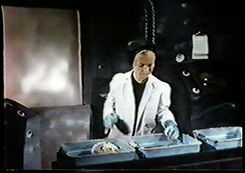 Easily one of the most interminable schlock films ever made, Flesh Feast makes Al Adamson look like a model of filmmaking savvy in comparison and would be completely forgotten if it weren't for the presence of Hollywood icon Veronica Lake, making an ill-advised comeback attempt as a scientist obsessed with maggots. Shot mostly around Miami, Florida (or, more accurately, a series of motel rooms in Miami), the film is 99% pointless yapping by the inept cast, with the other 1% consisting of Veronica toying with her precious wriggly friends and unleashing them on Nazi baddies. The story, such as it is, presents Lake as Dr. Elaine Fredericks, who uses larvae in a series of vaguely defined experiments to find the modern fountain of youth. A series of visitors from South America begin to cause trouble, abducting various people at the airport and arranging for Fredericks to perform her magic on a mysterious visitor named Max Bauer. Naturally these turn out to be neo-Nazis with a fiendish plot to unleash Der Furer on an unsuspecting world, but with the aid of newspaper editor Ed Casey (Phil Philbin), who's investigating the bizarre death of one of his reporters who was trailing an arms dealer, and Ed's assistant, Kristine Powell (Heather Hughes), our semi-deranged heroine finds a way to reveal her true motives. Completely devoid of such burdens as suspense, characerization, or any real reason for being, Flesh Feast earns its place in the history book solely for its fascination with "living, crawling maggots" and the oddly compelling spectacle of a nearly unrecognizable Lake overacting like mad actually makes one nostalgic for Dana Andrews in the comparatively high class The Frozen Dead. Director Brad Grinter continued to bless grindhouse viewers with his talents in such further epics as 1971's Blood Freak, the world's strangest mutant turkey movie, but never again was he allowed to trash a fading star's reputation to such a disturbing degree. As bad as it is, Flesh Feast might at least be bearable with a decent transfer, which it certainly didn't receive here. The Beverly Wilshire DVD appears to be mastered from an EP-speed VHS dupe of the long out-of-print World Video edition and, along with The Brood and Galaxina, could be the worst release so far in the format's relatively brief history. Contrast is nonexistent, dropouts litter the screen, focus is smudgy and blurry, and colors are pasty and washed out. If you really must see this film and can find absolutely no other way to do it, then maybe the disc will be worth the eight or nine bucks it goes for in some outlets, but otherwise, steer clear!